Belleek is something that once you see and hold it, you can spot it a mile away, behind other things, in a dark corner, on the bottom shelf. 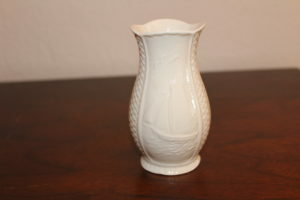 When I spied this vase at a thrift store, I immediately knew what it was. It was only when I got it home that the significance was known; it is from the Galway Irish Crystal Heritage Centre. With O’Donnell in the family tree, Galway is very special as that is where the O’Donnell clan is concentrated. And while I do not have any Galway Irish Crystal yet, I’m going over patterns and intend on adding it to my Irish arts collection. 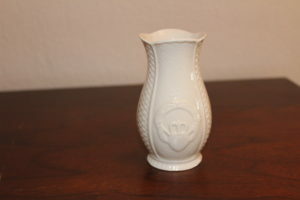 The Claddagh is on one side of the Belleek vase. A sailboat is on the other side. Galway being on the West coast of Ireland, the sea plays an important role in the area’s economy, heritage, history and recreation. 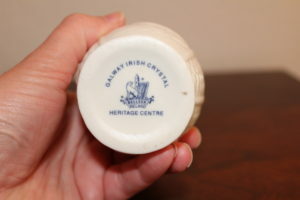 Heritage Centre stamp and Belleek logo.